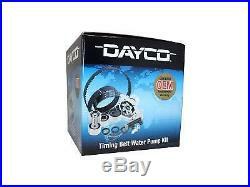 DAYCO TIMING KIT INC WATERPUMP FOR LANDCRUISER PRADO 3.4 VZJ95R 5VZ-FE 96-03. Nov 2002 - Apr 2005, 3.4L, V6, 24V, DOHC, MPFI, VZN167R, EngCode: 5VZ-FE. Nov 2002 - Apr 2005, 3.4L, V6, 24V, DOHC, MPFI, VZN172R, EngCode: 5VZ-FE. Jul 1996 - Feb 2003, 3.4L, V6, 24V, DOHC, EFI, VZJ95R, 132kW, EngCode: 5VZ-FE. Timing belt kit inc waterpump. Timing belt Teeth: 191 Width: 36mm. Timing belt seal kit (3 seals). Why replace the timing belt alone? Worn or wearing tensioners, pulleys and idlers can cause a new timing belt to fail in a very short time. A timing belt failure can result in costly engine damage. Dayco® Timing Belts, when replaced in conjunction with the tensioner, idler Pulley and oil seals, restore the optimum operating conditions for the timing drive system. All Dayco timing kit components meet or exceed OEM specifications. If we do not have the product in stock there could possibly be a short delay of around 3-7 days to get the item into stock from the particular importers and dispatched and on its way. The item "DAYCO TIMING KIT INC WATER PUMP FOR LANDCRUISER PRADO 3.4 VZJ95R 5VZ-FE 96-03" is in sale since Friday, April 15, 2016.